Received: ARC from the publisher - thank you! I'm a creature who loves to travel. So when I first heard about this novel, my interests were definitely on high alert. However, my preferred form of travel involves airline tickets and hotel reservations. The idea of sleeping in the jungle under a mosquito net and washing my body with a bucket of well water (that may or may not have been used already) didn't exactly scream Ginger's Dream Vacation! But that's the beauty of literature, we can escape to places we never thought we'd venture to, and completely lose ourselves among the pages. 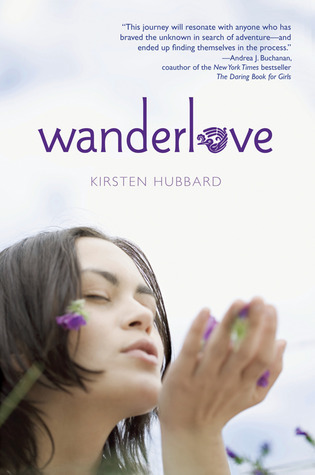 That is exactly what I did with Kirsten Hubbard's Wanderlove. Bria has just graduated high school and is on the brink of the rest of her life. She's caught between her past, the mistakes she's made, and the future which she is not so certain about. On a whim, which is so not Bria, she decides to take a couple weeks vacation to Central America with a group of total strangers - the Global Vagabonds! Once Bria steps off the plane in the muggy air of Guatemala, she soon realizes what a horrible mistake she's made. The tour group she thought she signed up for turns out to be a bunch of middle-aged typical tourists, fanny-pack and all. Just when she thought her life could not get any better, she literally runs in to Rowan, the seasoned backpacker that reeks of experience and adventure. On another whim, Bria decides to follow Rowan and his sister on the not so mapped out adventures across Central America. The journey that Bria travels along contains vast jungles, endless blue waters, and a million new types of insects she'd rather forget about. Aside from the physical journey that Bria descends upon, it's the personal growth that stood out the most in my eyes. She is caught between the girl she thought she was, and the ambition to become a bold and daring new Bria. I admired her want to be someone new, but understood her fears of actually taking the plunge. It's a scary reality to face. With the help of Rowan, and her love for art, she begins to shed her old skin and discover the girl she's meant to be. I love stories that are about self-discovery, but not in a preachy way. This novel flowed so nicely that I forgot just how far and wide Bria allowed herself to grow, until it literally hit me right in the face. The scenery was so breath-taking that I could image every scene as if I were there, laying in that hammock staring up at an endless blanket of stars. This is a novel that will linger with you long after you've finished. It's a journey you won't want to see end, with that feeling of not being ready to unpack your bags just yet. Wanderlove has definitely captured my heart. Ahhh...this speaks to my heart. Definitely a hard look at the person I am and the person I see myself as...not always the same. YES! I hate when books are preachy. And I think Wanderlove showcases the perfect amount of change with growth without beating the reader over the head with it. P.S. yes, I realize this is incoherent rambling - I have hardly slept in two days so my brain doesn't function well. I enjoy travelling too but yeah, my idea of vacation is flights + hotels too. Reading your review was interesting because I can't imagine doing that at ALL. I admire the character for doing it and I think with a novel like this, it's hard to escape the self discovery bit. I'm glad it wasn't preachy though because that irks me. I wasn't going to try this book but I think I will now! This book slayed me with the self-discovery. I wish we all could have that ah-ha! moment like Bria did. Loved it sooo much. Though the story does sound interesting. I'm just going to come out and say it - I ABSOLUTELY LOVED THIS BOOK. Bria's personal journey was what really made it stand out for me, but I loved hearing about the places she traveled to as well :) I totally wanted to just pack my bags and go after finishing it! I was just reading about this book, not even 30 min. ago. Sounds intriguing, can't wait to give it a try! Reading reviews of this book is my new favorite thing. UNIVERSAL LOVE! Beyond pumped to read this one very, very soon! oh! Ive got this waiting for me on my kindle and I really need to read it soon! great review! Sounds like a great book. I also enjoy reading self-discovery as long as they are not preachy. Need to add this one to my wish list. What, you don't like well water and mosquito nets? Hehehe NEITHER DO I. Especially because for some reason, mosquitos seem to absolutely love me. This book sounds really really great! Although Bria sounds like a crazypants for crossing central America with complete strangers, I will definitely be reading this! Wanderlust! Wanderlove! I wanna read this book! I need a little adventure in my life. This sounds great!